If you’re a Taleo ATS client, you are likely frustrated with how your default job pages look “out of the box” without any customization. And that’s a clear obstacle to you having effective employer branding/candidate experience. Below are 5 examples of employers using “overlays” to Taleo to give themselves job pages that stand out, engage and convert. Ongig powers the first one we show (BMC) but I mention other options you have of obtaining Taleo overlays at the bottom of this article. Video for Hero Media — First off you’ll notice they have video. This is a great way to get the attention of candidates as most Taleo-based job descriptions do not have videos and nearly all that do have them either as a link or as a smaller thumbnail. The employer uses multiple videos in their JDs and each one gives a good sense of the culture of the company (and some videos are unique to the job). Gallery of Photos — If you click the right arrow (the subtle white symbol to the right of the plant in the video), you can see a gallery of photos. This helps communicate their culture. Again, only about 1 in 50 Taleo-based job descriptions show images. Branding/Color Scheme — You’ll notice that the employer uses orange throughout the JD to reinforce their brand. The Taleo ATS doesn’t typically include color in its job descriptions. Talent Community — The employer provides a way for candidates to join their Talent Community (useful since only 11% of candidates visiting a job description typically apply (that leaves 89% of candidates for you to capture in another way!). Comments/Chat — They allow the candidate to ask a question or leave a comment to the job owner (recruiter). The best candidates (including Millennials/Generation Z) put a high value on such transparency. Glassdoor Ratings & Reviews — Again, the best candidates love transparency. And putting ratings and reviews on your own job descriptions means that the candidate is less likely to leave your page! “Who You Know” LinkedIn Widget — They use a LinkedIn widget to let candidates see how they’re connected to the employer. Header/Footer — They include a header and footer with logo — this may seem straightforward but the standard “out of the box” Taleo job descriptions do not allow this. Hero Media — The picture pops for the candidate. Readability — They use a 2-column format for better readability (Taleo’s standard is single-column (harder to read). Map — Their map makes it easy to see the location and surrounding landmarks. Header/Footer — They include a customized header and footer. Readability — They have a 2-column format (easier to read). Color Scheme — They use the Pitney Bowes blue color for buttons and section headers. Social Proof/Employer of Choice– They include employer-of-choice award badges in the left hand-column (great social proof in an easy glance!). Talent Community — They include a Talent Community link on the job description itself (again, only 11% of candidates visiting a job description typically apply so you have 89% of candidates to capture!). Search — They include a search on every page. Color Scheme — They use the Conduent orange for the Apply button, the text of “Search”, the icon on the map, etc. Readability — Again, they use 2-column format which is proven to be easier to read. Featured Jobs — They show a handful of other jobs for the candidate to consider. LinkedIn Job Matching — They use the LinkedIn widget. Talent Community/Email Job Alerts — They include a way for candidates to join their Talent Network. Hero Media — They use an aspirational message as their hero graphic. Color Scheme — They have a consistent color scheme with the yellow, orange and blue. Readability — The 2-column format is easier to read than single-column. Job Alerts — They have an easy to use email job alert. Related Content — They use the right-hand column/border to add in “Related Content” with 3 key articles they want candidates to see. 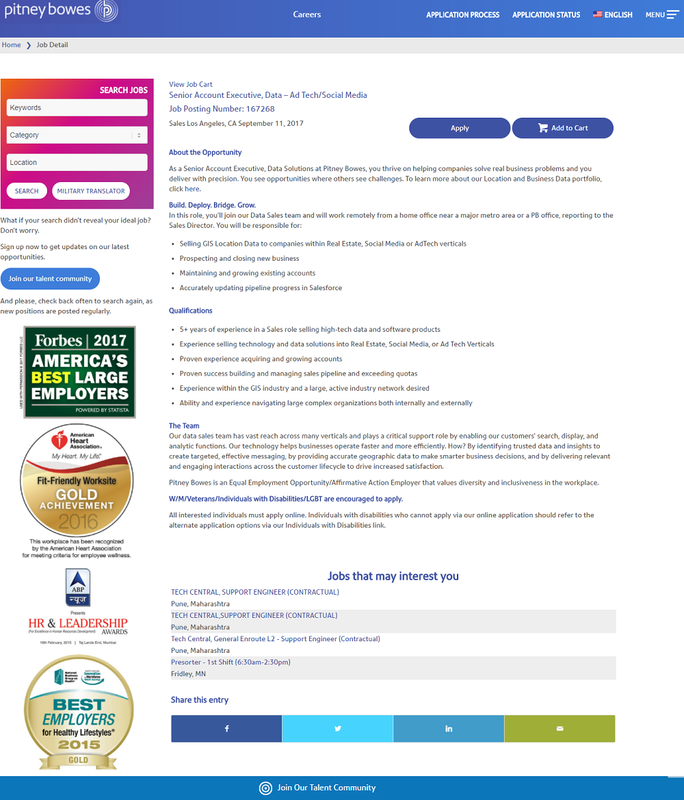 The Taleo ATS does not include any of the features above in their “out of the box” job pages. You instead need to do custom front-end software development (CSS-oriented) to get such “rich content” on your job pages. If you don’t have internal software developers to customize the job data coming out of your Taleo ATS, another alternative is to use a job marketing platform like Ongig (which powers the BMC pages above) where all the software development is built in and sends all candidates into the Taleo ATS. A third alternative is that you could hire a marketing/ad agency like TMP/TalentBrew (Conduent uses them). Ping me at rob@ongig.com or request a demo of Ongig if you want help transforming your Taleo job pages.